I made some delicious waffles this morning. I had adapted a few recipes into one, and this is what I came up with. Afterwards I realized I could have made the recipe better, and you'll see the change at the end of the post. Do not over mix the batter or it will be not good eats. In a bowl, combine the flours, sugar, baking powder, salt, and ground flax seed. Combine the egg yolks, milk, and oil; stir into dry ingredients just until moistened. In a small mixing bowl, beat egg whites until stiff peaks form; fold into batter. 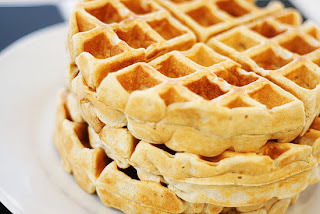 Bake 1/2 cup of the waffle mix in a preheated waffle iron. Should make 9 waffles. MAKEOVER: Use Applesauce instead of oil and you can save yourself 50+ calories! I do this all the time when baking, so I think it would work well in the waffles. You could even add cinnamon and nutmeg to give it some extra flavor without the calories of syrup.